By Meredith Chilson on December 22, 2012 Visit Meredith's Website. 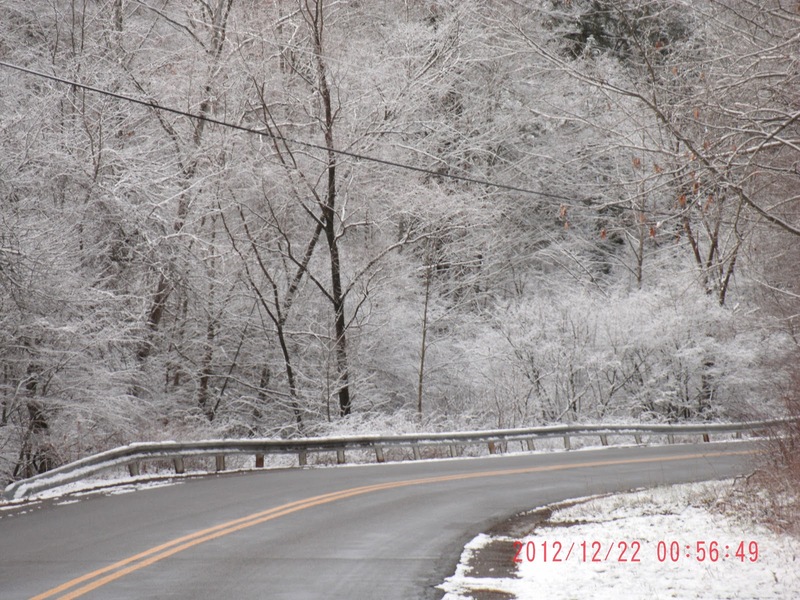 by Meredith ChilsonThe snow arrived on the first day of winter. It made me think of those old cartoons that showed time passing with an arrow pointing to the seasons—when the arrow clicked over to WINTER, the ground was covered with snow and icicles hung from eaves. That’s just about how it happened here. A few days ago, when the season was still AUTUMN, my chickens and I received a terrific pre-holiday gift: a trailer full of straw. It’s parked right next to the potting/garden/feed shed behind the coop, and those bales should help keep the girls warm and comfy through the chilly, blustery days ahead. · Insulation – According to those who actually use straw bales for building homes, there are some excellent insulating properties in straw: affordable and effective thermal and heat insulation and outstanding acoustic (sound) insulation. 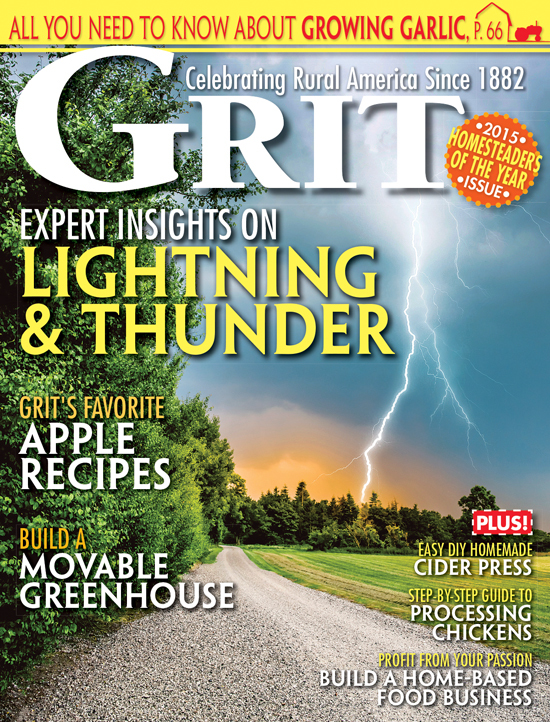 Read a bit more about straw bale home building HERE. You can even watch a video HEREabout using straw bales to build a chicken coop. 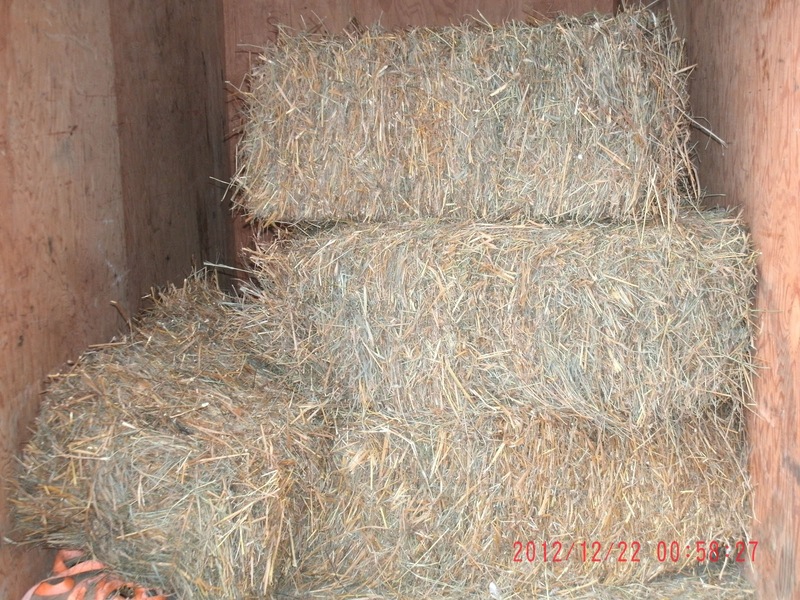 I like to keep a bale of straw at the entrance of the chicken coop in the winter. The doorway there is full-sized and on windy days a cold breeze blows through the doorway and into the corners of the coop. A bale of straw on its side is just right for blocking the cold wind. It’s also quite nice for inquisitive hens to stand on. On extremely cold and blowy days, I keep the coop door closed, and the straw bale blocks any winds that might consider whistling in or under the door. Our coop is not insulated, and on the few days that the temperatures drop below zero, I pile straw along the inside walls of the coop for insulating help, too. 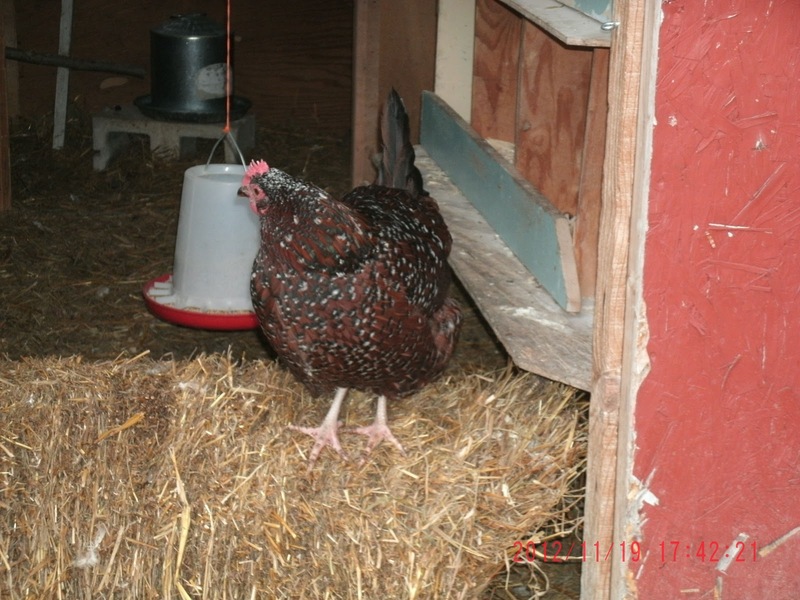 I hesitate to use bales of straw along the outside of the coop. Not only can I find better use for the straw (old hay bales would work as well, here), but also it seems to me that it would just encourage rodents to make winter nests. The coop is quite close to the road—there’s not a lot of traffic, but in the winter the snowplows are loud enough to wake me from a sound sleep. I would think the straw might help a bit to keep the sounds of the passing plows from the coop. 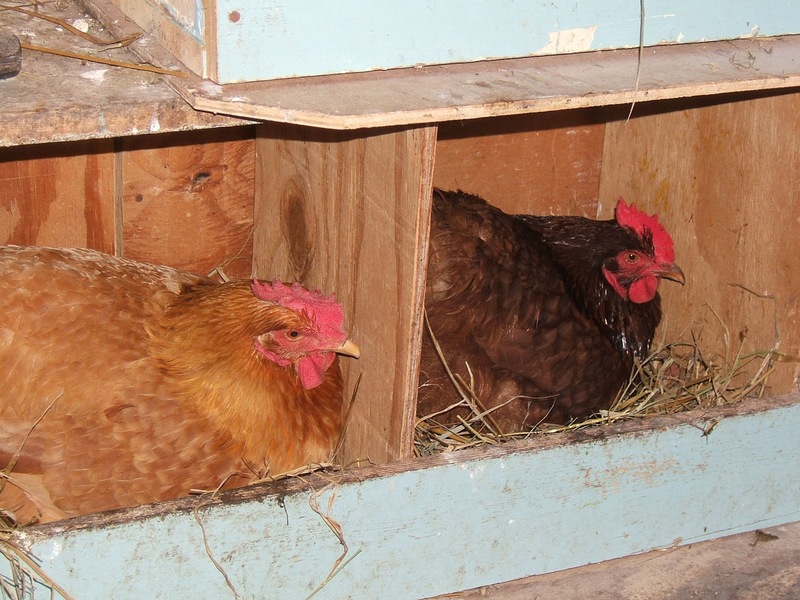 · Bedding/Deep Litter – There’s a wooden floor in our coop. I clean it thoroughly several times a year, but usually in mid-November, I start building a litter-insulated floor. I begin with a layer of flake shavings and then add straw. As the chickens work through the litter and add their droppings to it, I add more layers of shavings, sometimes a bag of dried leaves and additional straw. I try very hard to keep the litter from becoming wet—I watch especially around the waterers—and as long as the bedding stays dry, it just builds up. If there’s a mild day in January or February, I’ll sometimes clean under the roosts, but other than that the materials on the floor grow deeper and deeper. Harvey Ussery, in his book The Small-Scale Poultry Flock, describes deep-litter management in detail. Ussery says the deep winter “thick layer of organic duff” that results from layers of high-carbon material (like straw) scratched up by chickens depositing rich nitrogenous materials not only insulates the floor of the coop, but generates its own heat much like a well-turned compost heap. I know from personal experience that water in our coop is very rarely frozen solid; between the body heat generated by the chickens themselves and the warmth produced by the composting litter, the coop is not a terribly cold place even in deep winter. Fresh air comes in from under the eaves for ventilation, and by adding more litter before the coop becomes smelly, we have been able to keep the coop from generating unhealthy amounts of ammonia. Ussery, in the same book, does NOT recommend that straw be used on dirt coop floors because of the chance of molds, which can cause respiratory problems—however, “there is no problem using straw as the litter over a wooden floor”. And you know, I just love the way a coop smells when there’s fresh straw spread around—even if it’s covering up a foot and a half of partially composted litter. I like to have a layer of straw in the chicken run, too. For various reasons, we can’t free range our chickens, and it didn’t take long for the run to become vegetation free. A layer of straw keeps the run from becoming a mud wallow after heavy rains—and some straw strewn on light snow encourages the girls out of the coop for some exercise. · Nesting Material – Our girls like to lay their eggs in nests filled with straw. I sometimes use shavings, but the girls kick shavings out of the nests when they’re fluffing around getting comfortably ready for egg laying. Straw stays in the nests for a longer time, it seems. When I add fresh straw to a nest box, there’s usually at least one hen right at my elbow, ready to climb in, wiggle around and … well, make a nest of the straw. Often, I use a combination of nesting materials, just as I do with litter. If I add a layer of shavings to the nest boxes first, I mix in a little diametaceous earth –especially in the corners –for parasite control. Then I add the straw. 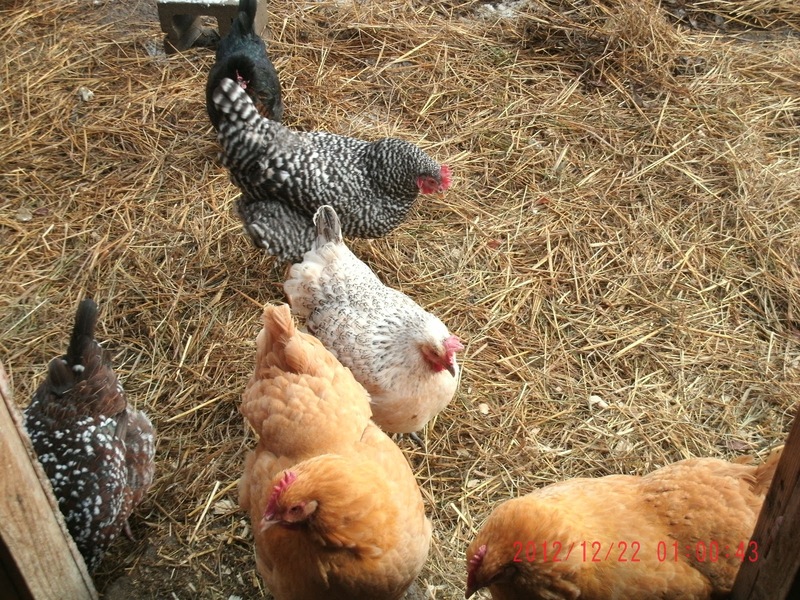 · Entertainment – When I spread out a “leaf” of fresh straw, there are chickens ready to begin scratching in it, sorting out weed seeds, an errant grain, even tiny green alfalfa leaves or flowers that were cut with the grain and mixed into the bale. It’s something different for the hens to work at, and it’s entertaining for me to watch, too. 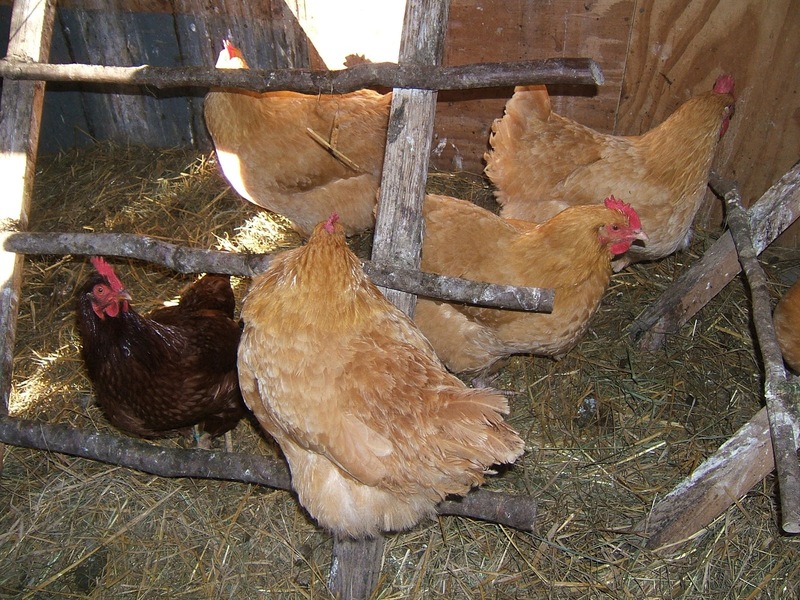 Bored chickens will often “pick” at each other, which can lead to big problems in a flock. One suggestion I’ve read has the chicken keeper making a maze out of straw bales for chickens to work their way through. I don’t have enough room, or enough straw bales to try this, but just having one bale in the coop doorway for chickens to hop on, tunnel behind (yes, they’ve done this) and jump from, makes me think the straw bale maze idea would work. · Garden Blankets – Most of my vegetable gardening is done in raised beds. I don’t use pesticides or herbicides in my gardens; I compost every possible kitchen scrap that doesn’t go to the hens. When I do the final chicken coop cleaning in the fall, all the litter from the coop goes onto the harvested garden beds. The snow eventually covers the beds, and in the spring the rich garden soil is ready for planting; the winter weather has aged the materials just right. When the arrow spins around to point at SPRING—when the litter is deep in the coop and the garden beds are awakening—the straw will be gone from the trailer. The straw-based litter that’s cleaned from the coop in the spring is nearly compost already. It will be put in with the “regular” compost that’s turned a couple of times a week and eventually added to mulch, new plantings and flower beds. The straw, shavings, chicken manure, and even traces of diametaceous earth enrich the earth around the greens that we plant to feed the chickens. We’ll watch Farmer Brown as he grows the grain and harvests the straw again next AUTUMN and maybe, just maybe, I’ll receive another terrific gift to keep the coop insulated, the nests filled, the chickens happy, and the gardens fertile for yet another season. I WOULD REALLY LLLLLLLLOVE TO WIN THIS!!!! AWESOME!!! I bought a couple bales of grass, that I spread around the run to keep the mud down and my hens love picking through it. I also use a bale of straw at the full size doorway to block wind. I bought a used dog run and added three side as an indoor/outdoor room going to the coop. It’s got a tarped roof and I put up sheets of plywood in the winter to keep it wind free. The girls love it and it stays dry. There’s a couple bales of straw in there for them to pick at and hop on. Sounds like you have happy hens! I’ve not been using straw, but rather old (but still good) hay that my mother’s mule did not manage to eat during past winters. It’s been great at keeping down the mud in their run, and, though I never thought of chickens as hay-eaters, the first thing the girls do when I throw new flakes in is start snacking on it (and on the blades of grass, not just any seed heads that are included. Hay won’t stand up quite as well as straw in some applications, but the fact that it doubles as food is pretty nice! It’s a good way to use up weedy hay that can’t go on garden beds, too. Just a cautionary note about hay, or grass, for that matter: if chickens eat too much, they can become crop bound–it can get wadded up in their crops and not pass through as it should. They don’t seem to eat straw, just the leaves and seeds. It’s one of those things–if you haven’t had a problem, that’s good, but you might want to watch for it. And you are right–garden beds are no places for weedy hay! Thanks for responding–hoope you’re out of the path of the storms. I’ve tried a scaled-down maze (two bales, one straw and one alfalfa) in my modest-sized run, and it does help with picking and aggression. When a Cooper’s Hawk started hanging around the neighborhood this fall and making my girls nervous, I took it one step further by breaking the alfalfa bale into “blocks” from a few inches to a foot thick and arranging them and the straw bale into a roofed, T-shaped “fort” with three entry/exit points. It seems to give the girls a sense of enhanced security, as they spend more time outside (much of it inside the “fort”). My girls also loved breaking up decomposing straw bales that had spent a couple of seasons as the walls of a raised garden bed. Tossing some scratch into the loose straw gives them hours of foraging fun. That’s a great idea–I think my girls would like a “fort”. You’re right about decomposing straw bales, too–they can harbor all sorts of goodies that chickens might enjoy. Thanks for sharing!